Things Moms Like has a couple of really nice giveaways going on that would make fantastic Christmas gifts for the kids. So of course I am entering! She's giving away two books from Scholastic. The titles are The Nutcracker and the Mouse King and The Christmas Magic. Both books look beautiful. Every year I try to purchase a couple new Christmas books to go into our holiday library for the kids. These books would be beautiful additions. She's also giving away a Dora the Explorer Christmas CD and a Dora’s Christmas Carol Adventure DVD. My little E is just starting to like Dora. We have no Dora DVDs so this would be fantastic. Truth be told I would rather my kids watch DVDs of shows or movies they like rather than TV. We miss all the commercials and "I want's" that way. :) I think I might have a little girl here that still would enjoy this too, although she wouldn't admit that in public. Waiting ever so patiently for supper...well 2 are anyhow. Today was day two and Bub opened the Make Holiday Rice Krispie Squares envelope. The big kids were pretty excited about this one because I basically let them do most of the work. I just told them what to do next. I did take over pouring the stuff into the prepared pan because I was nervous about someone getting burned but that's all I did. They have already asked if we can make these again because there is still lots of Rice Krispies left in the box. :) Here are some pictures of the cooking fun! Time for E to add the cereal! If you have products or services that fit into the following categories, email me at luvschweetheart [at] gmail [dot] com to request a review and/or giveaway on Typical Ramblings, Atypical Nonsense. Our family consists of a 37 y.o. Mom & Dad, 9.5 year old girl, 12.5 year old boy, and a 20 month old boy. 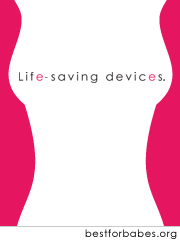 If you have a product that you think our family would enjoy, please email me. I do request a sample product when doing a review or giveaway. This is so that I can provide the best review possible for your company. I will only post a positive review of your product. If while testing your product I find it isn't something I want to recommend to my friends or readers I will contact you to discuss it privately. I finally finished our envelopes, put the activities in them and got it hung up on the wall just in time to start opening them. Tonight Bean opened the first envelope. For day one the kids got to write their Christmas wish lists to Santa. The letters are sealed, addressed and ready to be posted. Here are some pictures of the kids writing their letters. So it's been a few weeks since I've posted my menu, but now I'm back! Things are really getting busy around here. How bout at your house? If you don't usually menu plan this would be the time to really think about starting. With so many activities for the kids, Christmas concerts, parties, ect. wouldn't it be nice not to have to stand in front of the cupboards at 4:30pm wondering what to feed these people that are already asking you "what's for dinner mom"? Even if you only plan your supper menu and just wing it for breakfast & lunch, your evenings will be so much easier. With printable recipe cards (click pics to save and print) & links to original recipes where noted. 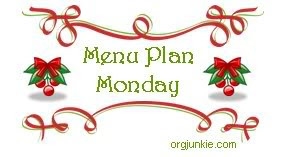 Inspired to menu plan this week? Need more ideas for menu planning? Head on over to Laura's at I'm an Organizing Junkie for hundreds of meal plans. This will be the fourth year I have done the 25 days of Christmas for the kids. Every year the kids look forward to finding out what we will do that day to celebrate the coming of Christmas. I find that doing this it makes us slow down and really enjoy the holidays. So many times Christmas is such a rush - getting gifts bought & wrapped, baking and cooking, parties and all of that fun stuff - that it's easy to forget to stop and just enjoy it. I just love Christmas and everything to do with it and I know the kids do too. I do this so they have some good fun memories of Christmas. Not just memories of it being over so fast. and I decided I wanted to make this. 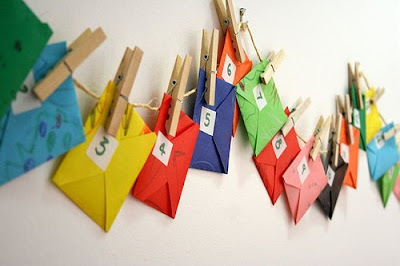 I made up 25 origami envelopes and inside I am putting each of the 25 activities we will do. The kids saw the envelopes last night when I was stamping the numbers on them and asked what they were for. I went ahead and told them and they are already excited. :) Here is what we will be doing from December 1st through the 25th. Merry Christmas! Have fun & enjoy spending the day together! I also have a few other activities planned if the weather cooperates. I would like to take the kids to Christmas in the Country at New Ross Farm Museum on December 6th. If we get some decent snow we'll do some coasting and maybe a sleigh ride if we can. Another week closer to the big day! How are your plans coming along? If you are in the States, how are your plans for Thanksgiving coming? Hopefully you're all doing well. So far this month I've been staying on track with my cleaning and working hard on all the rest. I'm looking forward to a fun month of December so keeping that in the back of my mind when I want to listen to my inner brat and not look at my to-do lists. Make one extra meal for freezer again labeled HOLIDAY MEAL.. Happy Monday! Hope everyone is well today. When I made up my menu for this week I was in the midst of dealing with the flu so I planned a week of crock pot meals. Hope you enjoy and many are new to our family but it's always fun to try new things! What are you cooking this week? Need more ideas for menu planning? Head on over to Laura's at I'm an Organizing Junkie for hundreds of meal plans. Can you believe there are only 45 days left until Santa arrives? I am really getting excited!! I swear I am like a kid when it comes to Christmas. It's not the presents - well I do love shopping and buying the presents, but I love decorating the house, baking, going to do fun Christmas activities and the snow! Oh I love the snow! Last week I had Bubs home with the flu and mid-week I ended up coming down with it too. He's all recovered and I'm mostly better now though, so that's good. Even with all of that I was able to get all my chores for last week done! Yay! And yesterday I got a head start on this week's chores - I went ahead and did my zone work in the kitchen while I had extra hands around to help with the baby. This week according to The Holiday Grand Plan site we are to be working on the garage and/or storage areas. We don't have a garage but our back shed could use some work. And it would probably behoove me to get the outdoor decorations out and ready to be set up before the snow arrives. I can put them under the deck for storage right now, since I think it's just a touch early to be setting them out. You'll want to head over over to The Holiday Grand Plan site to print off the lists for this week if you are planning on following all of their chores. I'll be doing that chore and I'll be of course doing my Flylady zone for this week. 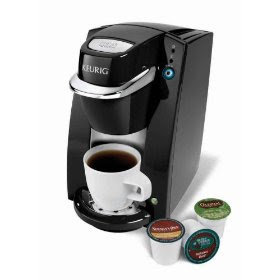 Finalize Gift list & go shopping! Clean trash can - oops forgot this! That's the plan for this week. I'm already off to a great start so I think I will try to do some little extra things here and there around the house to get a head start on some other rooms. How is your Christmas planning coming? If you are in the US, how are you doing on your Thanksgiving prep? Elizabeth over at Confessions of a Working Mom has awarded me with my very first blog award! I am so honored and excited!! Thank you Elizabeth for the award and thank you all for reading my blog. I'm so glad that you enjoy my rambling. 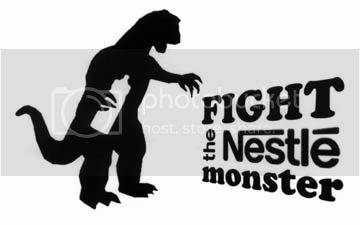 The rules state that I get to pass this along to 15 other newly discovered blogs that I love... Should any of you choose to accept this mission...post it on your blog together with the name of the person who has granted the award, and his or her blog link. Pass the award to 15 other blogs that you’ve newly discovered. Remember to contact the blogger to let them know they have been chosen for this award. Last week I didn't get as much done as I had hoped. With Halloween and a sick kid at home for half the week, I think I did fairly well. Halloween was fun and we lived in the moment of that. I think that is important to do. Getting caught up in what needs to be done or what we should be doing can sometimes spoil the fun that we could/should be having. Important to live in the moments you know - create those fun memories with the kids. The Holiday Grand Plan site says that this week's focus is on the family room. If you are following along with that site for the cleaning chores, you'll want to head over there and print off the forms you will need for this week's focus. I'll be doing the FlyLady zone for my focus and this week that is on the dining room and patio. Buy LED lights and put window lights up in the dining room. I know that some of my readers may be from the US, so you should be starting to think about what you are going to do for Thanksgiving. Start decorating now - a little each day if you have to, plan your menu, look for linens and things. There are a lot of details for you to cover so be sure to check out the Holiday Grand Plan site if you need a refresher of what you should be preparing now so that Thanksgiving goes smoothly for you. Be sure to stop over and see how my friends who are also doing the Holiday Grand Plan are making out with their goals. Feel free to leave them a comment as well, I'm sure they would love it! What a busy week! Did you all have a great Halloween? Ours ended up to be pretty good, all things considered. If you haven't heard by now we have what is presumed to be H1N1 in the house. Bub came home on Wednesday with all the symptoms and now I am giving everyone big doses of vitamin C, D, elderberry and lots of garlic. Garlic isn't just good for warding off vampires you know. Needless to say I've been a little busy dealing with sickies and trying to move on with Halloween, so I really didn't have much time to blog this week. Today I'm going to try to catch you up on what we did for Halloween fun. On Tuesday night we did our pumpkin carving. 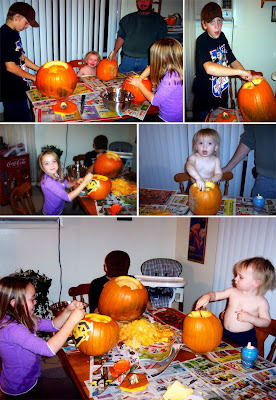 As you can see from the first picture there were a few tears from our youngest carver. In that picture he was upset because he couldn't dig in his pumpkin like the big kids could do. I quickly fixed that problem and we had some fun for awhile. This was his first year doing a pumpkin - it was pretty cute. He did try to taste the pumpkin innards a few times, that was funny to see. Of course we ran into tears again when the big kids were doing the actual pumpkin carving and all he could do was draw on his pumpkin with markers and pens. I had planned to let him paint his pumpkin but I was a little overwhelmed with all that was going on at the time. We had planned a bit better costumes before Bub got sick and since we weren't going to go out trick-or-treating we decided to just play it low key and just dress up enough to get a few pictures for the scrapbook. Bub was going to be a mummy. He was feeling miserable so we just ended up stopping with his face done. Little E is our little pumpkin - I just love that picture of him. Miss. Bean dressed up as an old lady. She has been wanting to dress up as this for a couple of years now. They had fun just dressing up this much and letting me take a couple pictures of them. Since the kids didn't get to go trick-or-treating I went out earlier and bought them a bunch of treats that we divided up. They decided it was much better getting treats that way because you didn't have to do all that walking. Yeah, this isn't happening every year kiddo's so don't get used to it. ;) After all that fun we turned out the lights, lit a few candles and watched some Halloween movies. 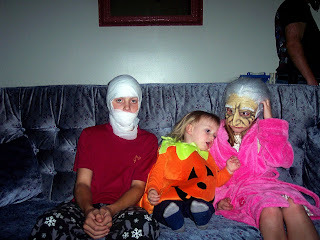 Overall we had a very nice Halloween, and the kids said it was even more fun than going trick-or-treating. I would definitely call that a success! How was your Halloween? Did your kids have fun dressing up? Have a post about your Halloween festivities? Leave me a link, I'd love to come see what you did! 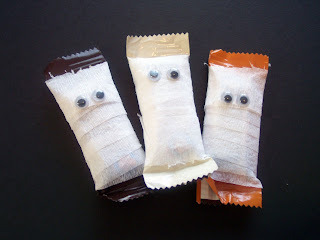 Halloween Mummies - Bub will be sharing these with all his classmates & friends. I also put a few in each of the teacher's baskets. He and I made these in under an hour, it was a lot of fun! Teacher's Halloween gift basket - includes a few packages of Hot Apple Cider mix, a package of homemade caramel corn, a Coffin that contains a few mummies, and a couple of cake pops will be added once we make them. Halloween box - Instructions for this box can be found here. Each of my baskets were made from a single 12x12 sheet of Stampin' Up! Ghostly Greetings DSP. I also made each of the kid's teachers a Halloween card to match their Halloween treat basket. The cards were fairly easy and quick to put together. They were CASED from some cards found on Split Coast Stampers. I have no idea now who made them, but whoever you are thank you for the great idea! Paper is all Stampin' Up! Stamp Sets are both Stampin' Up! - Eat, Drink & Be Scary! What are you making for Halloween crafts with your kids? Are you making anything for the kids to take to school or for their teachers? This coming Saturday is Halloween! Yay! I love Halloween, okay let's face it I love any holiday. Any excuse to do something fun and different is a good excuse in my books. 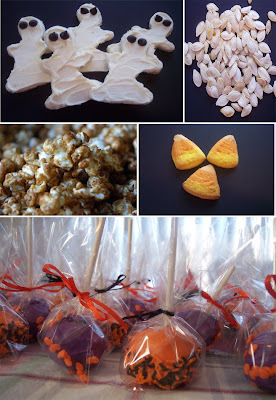 So this week the kids and I will be making caramel apples, roasting pumpkin seeds, they have asked for more caramel corn, and I will also be making special Halloween cake pops for Bean to take to school on Friday. Look for a post about those on Thursday sometime. On Friday we will be doing our traditional All Hallow's Eve supper. Every year I make something gross, well it doesn't taste gross but the name usually is, for supper on the night before Halloween. Halloween evening is just too busy running around getting costumes on and going to the mall for Trick-or-Treat, pop home for a quick bite to eat, then we head out into the neighborhood for some more Trick-or-Treating. Do you do anything fun or extra special for Halloween? We are half way through the Holiday Grand Plan! Can you believe it? I sure can't! I really need to step up my game from now on out. No more excuses! Last week went a bit better. I feel like I made better use of my time and really got some things accomplished. Not all of the things on my list but some of it - more than lately anyhow. That's a good feeling. Makes me feel like there is hope for the remaining nine weeks. :) This is going to be a fun week. We are on the last week before Halloween. I finally managed to get the house decorated for Halloween, made Halloween sugar cookies with the kids & caramel corn. I've started working on the kids treats they will be taking to school to share with their classmates. You'll want to check back on Tuesday for sure to see some of what we are making. I'll probably have a second post Thursday for the treats my daughter will be taking, since I can't make those too far in advance. We will also carve our pumpkins this week and roast the seeds. I'm excited & the kids are excited. The Holiday Grand Plan site says this week our focus is the Pantry and Closets. So if you are following that plan you'll want to go over and print off the sheets for this focus. I am of course following Flylady zones, so this week I'll be focusing on the living room. This will be the last time I can focus on the room before starting to decorate next month for Christmas (I start the weekend of the American Thanksgiving), so I really need to do a good job in here. Start addressing Christmas cards and writing Christmas letter. This week I will also start talking to the children about what they would like for Christmas. Time to get a list going and watching for sales. This week's list feels very do-able to me, so maybe I can get it all crossed off and maybe work on a few extra things if I have time. How are you coming on your holiday prep? Getting excited or starting to panic? Don't panic, just join in with me. Trust me you are not far behind at all - there is still plenty of time to get organized to have a peaceful holiday season. Be sure to stop over and see how my friends who are also doing the Holiday Grand Plan are making out with their goals. We have a few things going on this week in the evenings, so I tried to plan leftovers for one night and we'll have hamburger helper on the other night. I really don't like HH but the kids and dh looove it. So every once in awhile you'll see that pop up on the menu when I need something quick. Sunday: Panera's Cream Cheese Potato Soup in Bread Bowls and salad - We had this last week & loved it so much I had to make it again!